Master of Applied Linguistics graduate Jarrad Merlo co-founded an online company that prepares candidates for English language exams. The learning platform delivers one on one tutorials with teachers around the world. A chance encounter on the Frankston line changed Jarrad Merlo's life. He had just moved back to Melbourne from a stint teaching English in South Korea. While living penniless at his Grandma's house one day he bumped into a fellow "linguistics nerd" on the train. They both started talking about the huge potential for online teaching to revolutionise how languages are taught. 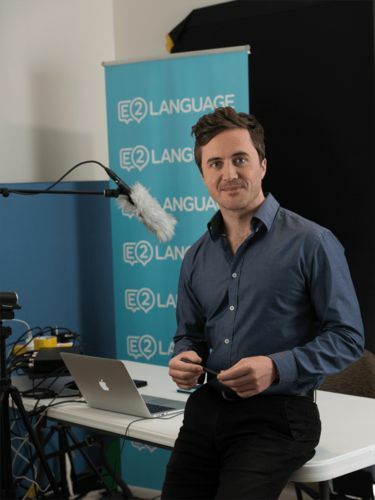 Five years and a Master of Applied Linguistics later, Merlo is the co-founder of E2Language, an online company that prepares candidates for English language exams. "There are three things that we do," he explains. "We've built a teaching and learning platform for language learning, we deliver one on one tutorials with teachers around the world, and we deliver live group classes." It all takes place online. Because he was particularly interested in digital learning, Merlo chose the Technology and Language Learning specialisation of the course. He also wanted to understand the academic literature around linguistics more broadly. "I really benefited from the degree," he says. "Even things like research methods and statistics, that's been really helpful in the business world. So the theoretical stuff actually translated to applied stuff." He's still in touch with some of his teachers, and has returned to the campus to give guest lectures in the course's Technology and Language Learning unit. He's even employed a couple of graduates of the degree. At E2Language, Merlo says that he's found plenty of demand for online language learning. In the last twelve months, the company has taught over 5,000 paying students, and run hundreds of group classes. Over 100,000 people have signed up to the service in the last 18 months. "The internet's opened up massive opportunities to do exciting things with language," he says. "Traditional models of language teaching are being challenged. The rules are being written from the ground up." Learn more about the Master of Applied Linguistics program.